How's the computer running now? Any other issues before we clean up? Thank you but I don't want to discuss this in an open forum. Click the Start button. Click Run. For Vista: type in Run in the Start search, and click on Run in the results pane. Then, press Enter, or click OK. 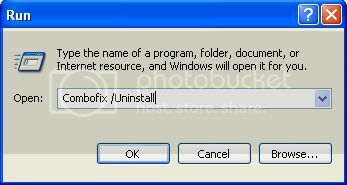 This will uninstall ComboFix, delete its folders and files, hides System files and folders, and resets System Restore. Select Yes when the "Begin cleanup Process?" prompt appears. If you are prompted to Reboot during the cleanup, select Yes. The tool will delete itself once it finishes. Note: If any tool, file or folder (belonging to the program we have used) hasn't been deleted, please delete it manually. Clean out your temporary internet files and temp files. Download TFC by OldTimer to your desktop. Double-click TFC.exe to run it. TFC will close all programs when run, so make sure you have saved all your work before you begin. * Click the Start button to begin the cleaning process. * Depending on how often you clean temp files, execution time should be anywhere from a few seconds to a minute or two. * Please let TFC run uninterrupted until it is finished. Once TFC is finished it should restart your computer. If it does not, please manually restart the computer yourself to ensure a complete cleaning. Go to Microsoft Windows Update and get all critical updates. I suggest using WOT - Web of Trust. WOT is a free Internet security addon for your browser. It will keep you safe from online scams, identity theft, spyware, spam, viruses and unreliable shopping sites. WOT warns you before you interact with a risky website. It's easy and it's free. SpywareBlaster- Secure your Internet Explorer to make it harder for ActiveX programs to run on your computer. Also stop certain cookies from being added to your computer when running Mozilla based browsers like Firefox.